The following is a guest post by Dan McCurry. Dan is a former chair of the Bow Labour party who provided the photograph for the masthead on this blog. He is a criminal defence legal adviser who grew up in the East End where is his late father was the vicar of St Dunstan’s in Stepney. Lime many others, he found the mayoral election campaign process difficult and he switched his support for the various candidates more than once. The following are his views, not mine, and they were first aired on the Labour Uncut website yesterday. However, given Dan’s activism in the Tower Hamlets Labour party, they’re worth repeating here. We used to be proud of spreading our ideas around the world. Now we are confused about how we explain our identity to the people who have settled here. The problem is that we need to understand their culture and identity, before we can explain to them our own. With 3,000 honour crime complaints to the police last year, maybe this is the issue that we’re failing to comprehend. It would help to understand what happened in Tower Hamlets last year, when the Labour party collapsed in on itself over the selection of Lutfur Rahman as candidate for mayor. It started out as a conversation about secularism. But we didn’t know it was about secularism, because in school we learn everything there is to know about Martin Luther King, but nothing about Martin Luther. We know about the rights of minorities, but not about the separation of church and state. This was in the days when Muslims were considered to be either moderates or extremists, with nothing in between. This perception was encouraged by the fact that the extremists got more airtime, but also due to the taboos about race and religion that suppressed debate about community, but allowed debate about terror. The row was mostly, but not exclusively, between Cllr Helal Abbas and Cllr Lutfur Rahman. Abbas was not devoutly religious, but Lutfur apparently was, and this is where Lutfur’s increasing clout in the community came from. Including all places of prayer, there are about 40 mosques in Tower Hamlets and most of them see Lutfur as their man. When Lutfur was first elected as a councillor, he was the apprentice of Abbas. Abbas didn’t complain that Lutfur brought the mosques’ vote with him, but when Lutfur struck out on his own, Abbas was furious. He denounced Lutfur’s religious connections, speaking of the global reaching tentacles of the Islamic forum for Europe, an organisation based at the east London mosque, and supportive of Lutfur. In east London, all politicians of all parties, seek to tap into faith organisations. When the doors of one are shut, they go knocking on another. Those who condemn these organisations tend to be the ones who have run out of doors to knock on. The scrutiny of Lutfur’s connections to the east London mosque began when a journalist called Ted Jeory arrived at the local paper. For years councillors had complained that they could never get anyone from the East London Advertiser to cover town hall meetings. Now they were complaining about this guy who kept turning up. Rather like the way that Arab dictators began by condemning Al-Jazeera, Tower Hamlets councillors quickly switched from condemning, to briefing, Ted Jeory. According to Ted, the briefings came from anyone who was ambitious, and included every candidate who would later stand in the mayoral selection. Others, such as the MP, Jim Fitzpatrick, were fearful that Lutfur could muster enough Labour votes to replace an incumbent. The fact is that Lutfur was on good terms with religious people across a spectrum of opinion, but he wasn’t a conduit for evil. He just didn’t realise that Labour people consider Islam to be authoritive, and not sharing the same values as us. In the fine line that a Muslim politician must walk, in a British political career, Lutfur was too far on the Bangladeshi side. However, this needs to be put into perspective. It’s not as if he was hanging out with suicide bombers. The rumours about extremist connections continued and reached a high point when Ted’s reports were picked up by Andrew Gilligan and broadcast in a C4 Dispatches film, where Jim Fitzpatrick took the controversy to a new height by alleging a plot to infiltrate the Labour party with Muslim extremists, “rather like militant infiltrated Labour in the 70s and 80s”. It sounds like a ridiculous now, but at the time the country was paranoid following the 7/7 bombings and ready to believe anything. Meanwhile, Labour head office was becoming increasingly nervous about what was happening in Tower Hamlets. The persistency of the rumours began to turn even rational minds. In May 2010, Tower Hamlets had a referendum for a directly elected mayor, resulting in a mandatory six month time-frame for an election. Seeing an opportunity to bypass his isolation within the party, Lutfur ran in the open Labour party selection for mayoral candidate, and easily won, but a report attacking Lutfur, from Abbas, and also one from Cllr Bill Turner, was presented to the NEC and, without committee members having time to read them, a vote was taken to rule Lutfur out as candidate. Although John Biggs came second in the selection vote, the NEC gave the slot to third place Abbas. They may have feared that they would have been labelled as racist, if they gave the candidacy to a white man. In response, Lutfur tore up his Labour membership card and announced his intention to run as an independent against Abbas. The two old friends were now sworn enemies and it would be for the electorate to decide who would win. Lutfur did. In Bangladeshi village society there is little in the way of transparent rule of law. The community is governed by honour and shame. As a system, it seems to work in Bangladesh, but when transferred to the UK, we see both the good and the bad. We see a low crime rate, juxtaposed against a high perversion of the course of justice, as victims are pressured to drop charges. We see strong family life, juxtaposed with school girls disappearing from the roster, without notice or explanation. We see a moralistic society, where alcohol is shunned. Yet when youths gather in groups on street corners to drink alcohol, as an act of rebellion, they will eventually face severe and violent retribution, from the “community”. The lack of transparency undermines the justice done by creating other injustices. This is brutally demonstrated when false rumours are spread against individuals who have displeased someone in the community. I first saw this phenomenon when Oona King backed the Iraq war and the community turned on her with the most astonishing slander. She was alleged to be a Mossad spy, who wanted to criminalise the veil and remove halal food from school menus. The fact that such rumours are unbelievable is beside the point. This kind of attack is a referendum against an individual. If the rumours catch on, then the community consensus has turned against that person. If the rumours fail, then the individual has the respect of the community. However, the attack on Oona was less to do with Iraq and more to do with a consensus in the community that it was time for a Bangladeshi to be MP, and that the MP should be a man. The allegations against Lutfur are different to the rumours about Oona, in that the target audience was the white community. The Labour party had unwittingly become a part of the system of honour and shame, and had no understanding of the issue to help them cope. The result was division and misery. Today, Tower Hamlets politics is deeply divided. Every time the two sides of the council meet to agree on working together, the agreement is then sabotaged by Labour people who want to see Lutfur kept permanently out of the party. The bitterness amongst Lutfur’s people is plain and highly visible. They now attack the Labour councillors in return. So deep are these divisions that Lutfur refuses to sit on the committee that will hire the new chief executive for the local authority. The Labour group has a majority on this committee, but no chief executive is going to take the job without the cooperation of the mayor. Catch 22. Meanwhile, in the party, with Lutfur gone, there is a lack of good Bangladeshi activists who can make future councillors. It is unrealistic that any of the current Labour councillors would win against Lutfur at a future mayor election. The Bangladeshis see him as a victim, while the white people continue to see him as the Labour bloke. The situation is bogged down and tragic. If Lutfur was to reapply to join the Labour party, it is likely that he would be readmitted, but he point blank refused to. As far as he’s concerned, he is a victim in all of this. Meanwhile, Ed Miliband has washed his hands of the situation with no explanation as to why. The image of both sides drowning is apt. Yesterday, MP Barry Gardiner told me that “this is the first glimmer that Dow has some shame” about what is happening in Bhopal. He was referring to their decision to waive their sponsorship rights over the 2012 Olympic stadium wrap. Here is the story from today’s Sunday Express. DOW Chemical last night agreed to ­remove all its branding from Britain’s Olympic stadium in what was hailed as a victory by campaigners furious at its links to a disaster in India. The US corporate giant said it was agreeing to the “vision” of the 2012 Games by waiving its sponsorship rights to place its brand on a controversial fabric wrap for the stadium. 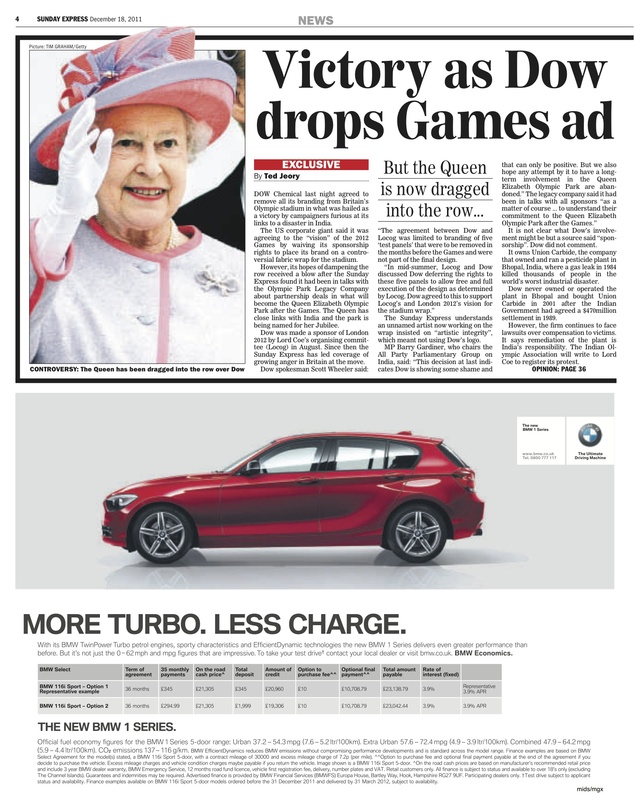 However, its hopes of dampening the row received a blow after the Sunday Express found it had been in talks with the Olympic Park Legacy Company about partnership deals in what will become the Queen Elizabeth Olympic Park after the Games. The Queen has close links with India and the park is being named for her Jubilee. Dow was made a sponsor of London 2012 by Lord Coe’s organising committee (Locog) in August. Since then the Sunday Express has led coverage of growing anger in Britain at the move. Dow spokesman Scott Wheeler said: “The agreement between Dow and Locog was limited to branding of five ‘test panels’ that were to be removed in the months before the Games and were not part of the final design. The Sunday Express understands an unnamed artist now working on the wrap insisted on “artistic integrity”, which meant not using Dow’s logo. It is not clear what Dow’s involvement might be but a source said “sponsorship”. It owns Union Carbide, the company that owned and ran a pesticide plant in Bhopal, India, where a gas leak in 1984 killed thousands of people in the world’s worst industrial disaster. Dow never owned or operated the plant in Bhopal and bought Union Carbide in 2001 after the Indian Government had agreed a $470million settlement in 1989. However, the firm continues to face lawsuits over compensation to victims. It says remediation of the plant is India’s responsibility. The Indian Olympic Association will write to Lord Coe to register its protest. This is not the end of the story. There are still some major questions to answer around the procurement process for this wrap. Last week, the Department for Culture, Media and Sport told me that Culture Secretary Jeremy Hunt was directly involved in the comprehensive spending review decision to drop the wrap from the original ODA budget in October 2010. He had been told by Locog that a sponsorship deal was “likely”. Had Dow, which had become an IOC sponsor only three months before that decision, already expressed an interest? These are questions that can now be asked in Parliament and possibly by a select committee investigation. It has been, and remains, a murky affair that has highlighted the tawdry links between corporate sponsors and the so-called Olympic ideals. Dow is trying to rebrand itself as an icon of “sustainability”, whatever that means. As I’ve written before, Dow undoubtedly does do some positive work, but it should be noted that it has never contributed a penny to any medical appeal in Bhopal. It wants to invest in water purification plants in India, but not in Bhopal where one is desperately needed. There is something deeply troubling about Dow piggybacking the London Games, which have made a great play of allegedly remediating a former industrial site in east London, when there is such a sinister reminder of its Union Carbide subsidiary’s own legacy still polluting groundwater and maiming children in Bhopal. When we look at the bigger picture, the real villain in all this is the International Olympic Committee, which gobbled up Dow’s sponsorship money in July 2010. From that moment, Locog was in a difficult position, although it would have been good to have seen Lord Coe show some of the backbone he demonstrated as an athlete, when he was a sporting here of mine. It is that deal with the IOC which will allow Dow to use the (tarnished) Olympic symbols in its marketing. What we have to watch out for now is a) whether its “sector exclusive” marketing rights allow it to display its brand anywhere else in the Olympic Park; b) how many VIP tickets will it have; and c) any continuing involvement the company may want after the Games (I understand they have discussed some sponsorship deals with the Olympic Park Legacy Company). Today’s news is a victory but it is not the end.